This summer the Roys will be saying “Hallå, Sverige!”—pronounced [haˈloː sværjɛ], we will have to practice!—as we travel to Sweden. I submitted a panel proposal to the International Research Society for Children’s Literature (IRSCL) 2019 Congress and it was accepted! I and two other musicologists who are doing pioneering work on music and childhood/children will give papers on the theme of “The Sounding and Silencing of Musical Childhoods;” more on that soon! 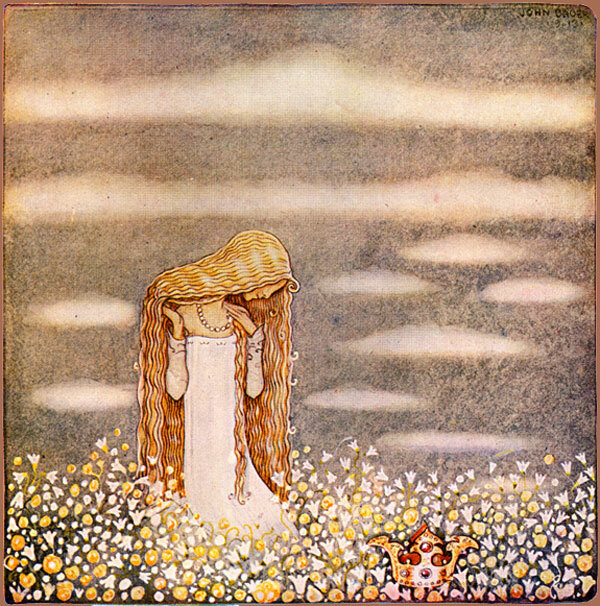 Princess Tuvstarr in the Field (1913) by Swedish illustator John Bauer. I am getting more and more excited about this trip, not just because the IRSCL will undoubtedly be an amazing experience, but because I know very little about Sweden and it gives me a wonderful opportunity to delve into its music, language, literature, and myths. By far the most compelling thing I have found recently is Rosenbergs Sjua (Rosenberg’s Seven), a musical ensemble comprised of four female vocalists and a string quartet. Their second album, R7 (1999) consists of arrangements of Swedish folk songs that are singularly riveting and haunting. The driving force behind Rosenbergs Sjua is Susanne Rosenberg: singer, composer, musicologist, and professor in the Royal College of Music, Stockholm. Her arrangements for R7 reflect her mastery of an eclectic variety of singing styles ranging from Swedish folk to Baroque to jazz, as the singers create amazing textures ranging from playful to epic to lyrical. The sixth track “Pris Vare Gud”—a nineteenth-century hymn text written by Johan Olof Wallin—begins with a layering of an improvisatory motif that creates a sort of drone for the mournful melody. Alternately track two “Min Bröllopsdag” alternates between tight harmonies in homorhythm and polyphonic scatting. The string section of R7 simply rocks! In addition to several instrumental dance tracks (four “Artos Julpolska” and thirteen “Nattöga”) which feature a wealth of idiomatic ornamentation, many of the songs are grounded in heavy, syncopated riffs worthy of a metal band. Listen to the first track “Leja Tjänstepiga” or the epic tenth “Balladen Om Liten Karin”. (The whole effect reminds me of the amazing instrumental arrangements of folk songs by the Danish String Quartet in their Woodworks (2014) album.) The contrast between voice and string in R7 —both equally strident at times—has a sort of hi-fi brutality that I prefer when it comes to modern arrangements of folk music. Your suggestions for further reading/listening as we look forward to Sweden are welcome! Ha det så bra!